Este blog va camino de los cinco (5) años naturales, no sin zancadillas, sinsabores y, como no, momentos y/o situaciones exultantes, cuestiones estas últimas recordadas con prevalencia sobre el resto. En esta entrada comentaba en los post scriptum el paso de los cuatro (4) años. ¿Hacia dónde se dirige moneditis? – Hacia el reposo meditado, con algún que otro “diente de sierra” y con la mirada puesta hacia el futuro pero sin perder de vista de donde vengo / experiencias vividas. El futuro de nuestras colecciones parece incierto, aunque ninguno tenemos una bola de cristal. Y de lo que el futuro nos depare, a nivel particular, ni hablamos…aunque…ni que decir tiene ¡Os deseo a todos los que esto leáis lo mejor para el 2018! 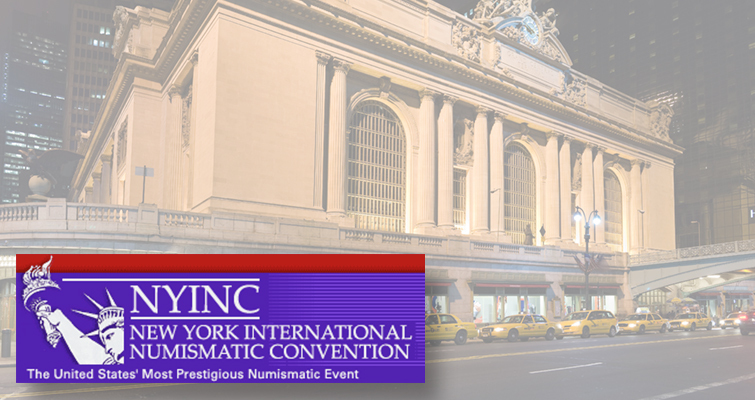 PS: NYINC http://www.nyinc.info/events.php ¡Empezando el año! Me ha parecido interesante este tipo, ceca y sobretodo año. Su explicación sobre la moneda merece la pena. COLOMBIA. 8 Reales, 1760/59-NRJV. Charles III (1759-88). NGC AU-58. KM-39 (for type, unknown date); FC-unknown; Cal-Type-108 (unknown date); cf.Gil-SF-8-2 (unknown date); Restrepo-Type-44 (unknown date). UNIQUE discovery coin. The fact that pillar dollars were minted at the Nuevo Reino Mint (Bogota) in 1760 has been known through numismatic literature for quite some time. Page 50 of A. M. Barriga Villalba’s reference “Historia de las Casa de Moneda” states that in 1760, 2,008 Marcos, 6 Onzas, and 0 Ochavas of silver were minted in the form of Pesos (8 Reales), 1 Reales, Medio (1/2 Reales) and Cuartillas (1/4 Reales). However, it is unknown how this is broken down for each of the corresponding denominations. The existence of minor coinage dated 1760 has been known to the numismatic community for quite some time. Approximately a dozen examples of 1760 1 Reales are known, while the 1/2 Real remains unique. The 1/4 Reales it is a different matter, as the Colombian dies for the Cuartillas denomination did not contain a date at this time. Furthermore, Cuartillas were struck each consecutive year from 1759-1771 (with the exception of possibly 1770); therefore, assigning a specific date to them is not possible. Previous to the discovery of this coin, only three dates were known of Pillar 8 Reales produced by the Nuevo Reino Mint (1759, 1762 and 1770). It is estimated that approximately 15 examples of the 1759 8 Reales are known today (See Restrepo pg.113), although this number may be as high as 20. Of the 1762 8 Reales, only two examples can be confirmed, one of which (Restrepo and Barriga Villalba plate coin) is housed in the Museum of the Casa de Moneda Bogota. The second example (Ex: Don Domingo de Irigoyen, Ex: Don Canaparo and Gilboy plate coin) was sold by Numismatica Ars Classica in March of 2002, Auction #22, lot #334 where it hammered for 260,000 Swiss Francs. There are rumors that a third example may exist, however this remains unconfirmed. In regards to the 1770 8 Reales, there are approximately 12 to 14 pieces known (Restrepo pg.120), all of which were found in the corner stone of a Church in Bogota in 2006. Prior to this discovery, 8 Reales dated 1770 were unknown to numismatists, even though there is a known mintage of 289 Marcos, 6 Onzas, and 0 Ochavas (see Barriga Villalba pg. 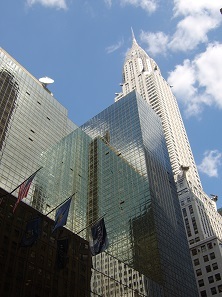 50). Unlike the Spanish Colonial mints located at Mexico City, Potosi, Bolivia and Lima, Peru, the mint of Nuevo Reino was not known for large outputs of silver coinage. All Colombian silver from this period was minted in small quantities and should be considered RARE. Unlike Mexico, Bolivia, and Peru, which were rich with silver mines, Colombia was not. To the contrary, the mines in Colombia were abundant with gold from which silver was a byproduct. Most of the silver coinage produced at the Nuevo Reino mint was a result of excess metal that was extracted while refining gold. When enough slag silver was extracted, it was then collected and made into coinage. For this reason there are large gaps in the dates that 8 Reales were minted. It is interesting to note that mintage figures do exist, stating that 8 Reales were produced in 1756 and 1761, however no example are known to have survived today. The unique 1760 8 Reales offered here features a few interesting and distinct features. 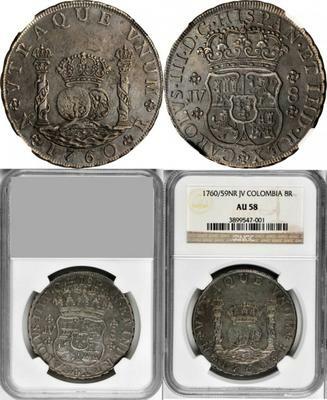 First and foremost the piece exhibits a clear overdate 1760/59 (the only known overdate for a Colombian Pillar 8 Reales). While there are multiple dies known for the 1759, the pillar side die is an exact die match to lot #296 in the July 1996 Bonhams auction of the Alexander Patterson Collection. The assayers initials on the 1760 are arranged “JV” similar to that of the 1759 Nuevo Reino 8 Reales of Ferdinand VI. For all other Nuevo Reino 8 Reales of Charles III (1762 and 1770), the assayers letters are arranged “VJ”, showing in the opposite order. The pillar side die features yet another variant with a large “V” in the spelling of the kings name “CAROLVS”, rather than “CAROLUS” as found in 1762 and 1770. 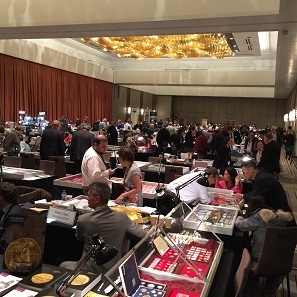 A remarkable and UNIQUE discovery piece that is sure to be one of the centerpieces of its new owner’s collection.